When I set up this site I had grand plans to blog regularly, well, it’s been a month now so it’s about time I made a start. From the file marked ‘completely missing the point’ comes a Vauxhall press release this morning that got me unduly wound up. 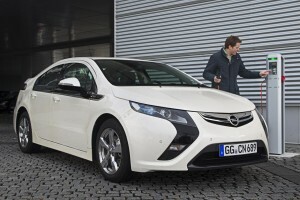 Vauxhall (actually it was really sister firm Opel) was making a great big fuss about the fact that a prototype of the new Ampera was going to drive the dizzying distance of 370 miles on a single tank of fuel. That’s the distance from Opel HQ in Russelsheim, Germany to Geneva, Switzerland. They’re even having bloggers ride along to tell the world what’s happening. Stop the press! No, don’t do that, I can get more than 600 miles out of my long term test BMW 520d. 370 miles is hardly an automotive milestone. In fact, if reports are to be believed, the fuel tank in the Vauxhall Ampera is about 30 litres in size, that equates to 45mpg. Nothing special. The final straw was the mention that a socket had been installed in Russelsheim to charge the Ampera. Big deal. Surely, the point that Vauxhall and Opel missed is the stunning fact that petrol engine in the Ampera is only a back-up for longer journeys. In the vast majority of situations it will be a full-electric car. Plug it in over night and you’ll easily get 40 zero emissions miles, but unlike electric only, you don’t have to worry about not making it home because the petrol engine will kick-in to re-charge the batteries. The result for most users will be a fuel consumption nearer 140mpg. Now that’s amazing.